More than 80% of women experience hot flashes (HFs) during menopause. Defined by transient sensations of heat, sweating, flushing, anxiety, and chills lasting for 1–5 min, HFs can cause considerable distress especially when severe and frequent., However, these are often ignored due in part to their relatively benign nature. In this review, we discuss epidemiology, pathophysiology, diagnosis as well as management of menopausal HFs. Among various factors reported to be associated with increase in incidence of HFs, a consistent association has been found only with obesity, African descent, lower socioeconomic status, presence of premenstrual syndrome, sedentary lifestyle, and smoking., Recently, the role of genetic factors in causation of HFs is being highlighted. In one study, evaluating 11,078,977 single-nucleotide polymorphisms (SNPs) in 17695 women, SNPs in intronic regions of tachykinin receptor 3 gene, which codes for neurokinin B neuropeptide receptor (NK3R), were significantly (Odd's ratio: 1.5) associated with menopausal VMS. However, lot remains to be done as far as the role of genetic factors in elucidation of menopausal VMS is considered. The underlying cause for HFs is abnormality in hypothalamic thermoregulatory mechanisms. As HFs are associated with menopause and improve following estrogen therapy, estrogen deficiency seems to play definite role in their causation. However, precise role of estrogen deficiency remains to be elucidated. There is no correlation between serum estrogen levels and frequency and severity of HFs. Furthermore, HFs cease with time after menopause when estrogen levels are further declining. Thus, the rate of decline of estrogen levels rather than actual decrease may be more important in causation of HFs.,, The prior priming of brain by estrogens also seems to play an important role in the generation of HFs as women with ovarian dysgenesis develop HFs only after withdrawal of estrogen replacement therapy. A potential role for other pituitary hormones, gonadotropins, and anti-mullerian hormones has been suggested but never proven. A role of serotonin has been suggested by several authors. Estrogens stimulate the production of serotonin and endorphins, and there is 50% decrease in levels of serotonin after menopause corresponding to declining estrogen levels. Decrease in serotonin results in increase in levels of norepinephrine which disturbs hypothalamic thermostat. Several indirect observations also suggest a role for serotonin and norepinephrine in the generation of HFs. These include (a) favorable response of HFs to selective serotonin reuptake inhibitors (SSRIs); (b) increased plasma levels of main brain metabolite of norepinephrine during HFs; (c) reduction in HFs by Clonidine (α2 adrenergic antagonist), a drug which decreases brain norepinephrine levels; and (d) Yohimbine (α2 adrenergic agonist), a drug which increases brain levels of norepinephrine may trigger HFs. Recent studies have suggested a role for hypothalamic kisspeptin, neurokinin B and dynorphin (KND) signal system in genesis of HFs. Neurons of this system control secretion of gonadotropins and project to median preoptic area which is the main hypothalamic thermoregulatory center. In experiment animals, central administration of kisspeptin increases rat tail skin temperature similar to that induced by estrogen deficiency. The findings of induction of HFs in postmenopausal women by the administration of neurokinin B coupled with evidence of increased expression of neurokinin B in postmortem brain samples of postmenopausal women also suggest a role for KND system in induction of HFs. The vasodilatory effect of CGRP is independent of histamine, bradykinin, prostaglandin, or epinephrine. In fact, HFs do not respond to antagonists of any of these substances. Cutaneous distribution of CGRP follows the distribution of sensory nerves which can explain why flashes prominently affect upper torso. CGRP is found in cholinergic sympathetic nerves of sweat glands and local administration of CGRP enhances methacholine-induced sweating in a dose-dependent manner. All these facts suggest a role for CGRP in genesis of HFs and future studies will help to delineate its role in a better manner. A typical HF begins as a sudden unexpected sensation of intense heat involving face and upper chest which rapidly involves the entire body. The sensation lasts from 2 to 4 min and is associated with profuse sweating, chills, palpitation, and anxiety. Their frequency varies from occasional attacks in a week to once or twice each hour. HFs often present as night sweats and are associated sleep disturbances. When severe these are associated with interference in activities of daily living and have a negative impact on quality of life., The approach to diagnosis and evaluation of HFs is summarized in [Figure 1]. The management of HFs is guided by their frequency and severity. The severity of HFs can be graded as (a) mild (no interference with usual daily activities), (b) moderate (interfere with usual daily activities to some extent), and (c) severe (when usual daily activities cannot be performed). The further management protocols can be directed according to the severity of HFs, presence of associated menopausal symptoms such as depression personal choice of patient and presence or absence of any contraindications to hormonal replacement therapy. The route (oral/transdermal/subcutaneous implant or intravaginal) of estrogen therapy should be individualized in liaison with the patient. The efficacy of oral 17-β estradiol (1 mg daily), transdermal 17-β estradiol (0.05 mg daily), and conjugated estrogen (0.625 mg daily) is almost the same with abolition of HFs in approximately 80% of women. As transdermal formulations have lower risk of thromboembolism and stroke, vaginal bleeding and breast tenderness, these may be used as initial treatment. One can start with 0.025 mg estradiol transdermal preparation or oral estrogen (0.5 mg estradiol daily) depending on the patient's preference. If required, dose is increased at monthly intervals to 0.05 mg transdermal estradiol or 1 mg oral estradiol. For severe HFs, 0.05 mg transdermal estradiol can be used from the beginning. As transdermal preparation avoid hepatic first mass metabolism, it can be used in women taking enzyme-inducing drugs. Transdermal preparation is also preferred in women on thyroid hormone replacement therapy as oral estrogens increase thyroid bindings globulins thereby decreasing the amount of free thyroxine. Women with intact uterus need progestins along with estrogens to prevent endometrial hyperplasia and carcinoma. To avoid irregular bleeding, preferred treatment includes natural micronized progestin 200 mg daily for 12 days a month in pre and perimenopausal women. For women intolerant to cyclic progestin therapy due to mood swings/bloating, daily therapy may be better. For women intolerant to oral progestin therapy, low dose levonorgestrel-releasing intrauterine device can be advised. For women without uterus, estrogen alone is used as only advantage of the use of progesterone is avoidance of endometrial hyperplasia. In the United States, conjugated estrogen (0.45 mg) in combination with bazedoxifene (20 mg) (a selective estrogen receptor modulator) is available for women who cannot tolerate estrogen or progestin therapy. Theoretically, this combination has agonist effect on bone, antagonist effect on endometrium and no effect on the breast. However, future studies are needed to check the efficacy of bazedoxifene. HRT is used for a maximum duration of 5 years or up to 60 years of age. It can be stopped in 40%–50% of women within 1 year and 65%–75% within 2 years of Rx., For women, who develop recurrence of HFs, nonhormonal treatment options are used first followed by extended HRT (beyond 60 or even 65 years of age) shall nonhormonal treatment options fail. Once a decision to stop HRT is taken, it is preferable to taper the drugs over 3–6 months. For women who develop recurrence of severe HFs, more gradual taper, over 6 months to 1 year, may be advisable., Low-dose oral contraceptive pill (OCP) containing 20 μg of ethinyl estradiol may be used instead of HRT in perimenopausal women (40–50 years of age) who desire contraception and have heavy bleeding. Once the woman reaches the age of 50–51 years, consideration should be given to either complete stoppage of OCP or replacement with HRT. Routine mammography and breast examination are recommended for women on HRT. For women, who have contraindications or cannot tolerate HRT, nonhormonal drugs are used for the management of HFs., The various nonhormonal treatment options include. SSRIs and SNRIs are the most effective drugs for HFs after HRT., Among the various SSRIs available, paroxetine (7.5–25 mg daily) and escitalopram (20 mg daily) are used as first choice, while fluoxetine and sertraline are not effective., The duration of therapy needed to demonstrate benefit on HFs is lower than the duration required to demonstrate their antidepressant effect. SNRIs (venlafaxine [37.5 mg daily increased to 75 mg daily after 1 week] and desvenlafaxine) are equally effective in the management of HFs. Gabapentin may be a better choice for women with predominant nocturnal HFs for its added benefit on the maintenance of sleep cycle. It is as effective as venlafaxine, but patients often prefer venlafaxine due to better tolerance profile of later. The dosage of gabapentin needs to be individualized. While a single 100–300 mg bedtime dose may suffice for predominantly nocturnal HFs, a dose of 300 mg three times a day may be required for severe and frequent HFs. To decrease sedation, it is preferable to start with 100 mg daily with gradual increase by 100 mg every 3 days to maximally effective or tolerated dose. While switching therapy from SSRI/SNRI to gabapentin, it is preferable to continue SSRI/SNRI for 1st 2 weeks while gabapentin is being introduced and taking its full effect. The other drugs (clonidine and pregabalin) are used only infrequently for the management of HFs. For women, who do not respond to one SSRI/SNRI, use another SSRI/SNRI itself before switching to another class of drugs. In case, these are ineffective or not tolerated, consider administration of gabapentin. – Although initial results of treatment with MLE4901 (a neurokinin 3 receptor [NK3R] antagonist) are promising, more studies are needed before NK3R antagonists can be recommended as nonhormonal agents for the treatment of HFs. Stellate ganglion block is known to alleviate HFs especially of moderate to severe intensity., However, more studies need to be done before this procedure can be used routinely. These include cognitive behavioral therapy, plant-based therapies, weight loss, evening primrose oil, flaxseed, ginseng, wild yam, black cohosh, progesterone creams, medicinal Chinese herbs, reflexology, and magnetic devices. However, these are either ineffective or their efficacy remains to be proven in large clinical trials.,, Various treatment options have been summarized in [Table 1]. Acupuncture has been used for the management of menopausal HFs for quite some time but without much evidence., However, a recently conducted RCT in Danish population (n = 70), showed the efficacy of acupuncture in statistically significant amelioration of HFs, general sweating, day-and-night sweats, menopausal-specific sleeping problems, emotional and physical symptoms as well as skin and hair symptoms. The beneficial effects of acupuncture were seen 3 weeks into treatment and most of the participants tolerated the procedure well. However, this study had relatively small sample size (n = 70; cases = 36; controls = 34), follow-up was of short duration (5 weeks) and placebo group was not well-defined. Future studies employing larger sample size will further help in delineation of the role of acupuncture in menopausal HFs. HFs continues to be an important symptom in peri- and post-menopausal women. A careful approach to diagnosis and management using predefined algorithms often alleviate HFs and improve quality of life of women with HFs. de Zambotti M, Colrain IM, Javitz HS, Baker FC. Magnitude of the impact of hot flashes on sleep in perimenopausal women. Fertil Steril 2014;102:1708-150. Freeman EW, Sammel MD, Sanders RJ. Risk of long-term hot flashes after natural menopause: Evidence from the Penn Ovarian Aging Study cohort. Menopause 2014;21:924-32. ACOG practice bulletin no. 141: Management of menopausal symptoms. Obstet Gynecol 2014;123:202-16. Reed SD, Lampe JW, Qu C, Copeland WK, Gundersen G, Fuller S, et al. Premenopausal vasomotor symptoms in an ethnically diverse population. Menopause 2014;21:153-8. Col NF, Guthrie JR, Politi M, Dennerstein L. Duration of vasomotor symptoms in middle-aged women: A longitudinal study. Menopause 2009;16:453-7. Politi MC, Schleinitz MD, Col NF. Revisiting the duration of vasomotor symptoms of menopause: A meta-analysis. J Gen Intern Med 2008;23:1507-13. Ahuja M. Age of menopause and determinants of menopause age: A PAN India survey by IMS. J Midlife Health 2016;7:126-31. Hunter MS, Gentry-Maharaj A, Ryan A, Burnell M, Lanceley A, Fraser L, et al. Prevalence, frequency and problem rating of hot flushes persist in older postmenopausal women: Impact of age, body mass index, hysterectomy, hormone therapy use, lifestyle and mood in a cross-sectional cohort study of 10,418 British women aged 54-65. BJOG 2012;119:40-50. Avis NE, Crawford SL, Greendale G, Bromberger JT, Everson-Rose SA, Gold EB, et al. Duration of menopausal vasomotor symptoms over the menopause transition. JAMA Intern Med 2015;175:531-9. Zeleke BM, Davis SR, Fradkin P, Bell RJ. Vasomotor symptoms and urogenital atrophy in older women: A systematic review. Climacteric 2015;18:112-20. Huang AJ, Grady D, Jacoby VL, Blackwell TL, Bauer DC, Sawaya GF. Persistent hot flushes in older postmenopausal women. Arch Intern Med 2008;168:840-6. Makara-Studzińśka MT, Kryś-Noszczyk KM, Jakiel G. Epidemiology of the symptoms of menopause – An intercontinental review. Prz Menopauzalny 2014;13:203-11. Tepper PG, Brooks MM, Randolph JF Jr., Crawford SL, El Khoudary SR, Gold EB, et al. Characterizing the trajectories of vasomotor symptoms across the menopausal transition. Menopause 2016;23:1067-74. Randolph JF Jr., Sowers M, Bondarenko I, Gold EB, Greendale GA, Bromberger JT, et al. The relationship of longitudinal change in reproductive hormones and vasomotor symptoms during the menopausal transition. J Clin Endocrinol Metab 2005;90:6106-12. Gold EB, Sternfeld B, Kelsey JL, Brown C, Mouton C, Reame N, et al. Relation of demographic and lifestyle factors to symptoms in a multi-racial/ethnic population of women 40-55 years of age. Am J Epidemiol 2000;152:463-73. Whiteman MK, Staropoli CA, Langenberg PW, McCarter RJ, Kjerulff KH, Flaws JA. Smoking, body mass, and hot flashes in midlife women. Obstet Gynecol 2003;101:264-72. Crandall CJ, Manson JE, Hohensee C, Horvath S, Wactawski-Wende J, LeBlanc ES, et al. Association of genetic variation in the tachykinin receptor 3 locus with hot flashes and night sweats in the women's health initiative study. Menopause 2017;24:252-61. Freedman RR. Menopausal hot flashes: Mechanisms, endocrinology, treatment. J Steroid Biochem Mol Biol 2014;142:115-20. Sturdee DW, Reece BL. Thermography of menopausal hot flushes. Maturitas 1979;1:201-5. Sturdee DW, Hunter MS, Maki PM, Gupta P, Sassarini J, Stevenson JC, et al. The menopausal hot flush: A review. Climacteric 2017;20:296-305. McLaren HC. The induced menopause. J Obstet Gynaecol Br Empire 1941;48:23-40. Chakravarti S, Collins WP, Newton JR, Oram DH, Studd JW. Endocrine changes and symptomatology after oophorectomy in premenopausal women. Br J Obstet Gynaecol 1977;84:769-75. Freedman RR. Biochemical, metabolic, and vascular mechanisms in menopausal hot flashes. Fertil Steril 1998;70:332-7. Seminara SB, Messager S, Chatzidaki EE, Thresher RR, Acierno JS Jr., Shagoury JK, et al. The GPR54 gene as a regulator of puberty. N Engl J Med 2003;349:1614-27. Krajewski SJ, Burke MC, Anderson MJ, McMullen NT, Rance NE. Forebrain projections of arcuate neurokinin B neurons demonstrated by anterograde tract-tracing and monosodium glutamate lesions in the rat. Neuroscience 2010;166:680-97. Kinsey-Jones JS, Li XF, Knox AM, Lin YS, Milligan SR, Lightman SL, et al. Corticotrophin-releasing factor alters the timing of puberty in the female rat. J Neuroendocrinol 2010;22:102-9. Franco-Cereceda A, Gennari C, Nami R, Agnusdei D, Pernow J, Lundberg JM, et al. Cardiovascular effects of calcitonin gene-related peptides I and II in man. Circ Res 1987;60:393-7. Skorupskaite K, George JT, Anderson RA. The kisspeptin-GnRH pathway in human reproductive health and disease. Hum Reprod Update 2014;20:485-500. Noguchi K, Senba E, Morita Y, Sato M, Tohyama M. Alpha-CGRP and beta-CGRP mRNAs are differentially regulated in the rat spinal cord and dorsal root ganglion. Brain Res Mol Brain Res 1990;7:299-304. Kobayashi T, Ushijima O, Chen JT, Shiraki M, Ohta T, Kiyoki M, et al. Basal tail skin temperature elevation and augmented response to calcitonin gene-related peptide in ovariectomized rats. J Endocrinol 1995;146:431-7. Brain SD, Williams TJ, Tippins JR, Morris HR, MacIntyre I. Calcitonin gene-related peptide is a potent vasodilator. Nature 1985;313:54-6. Goodman EC, Iversen LL. Calcitonin gene-related peptide: Novel neuropeptide. Life Sci 1986;38:2169-78. Landis SC, Fredieu JR. Coexistence of calcitonin gene-related peptide and vasoactive intestinal peptide in cholinergic sympathetic innervation of rat sweat glands. Brain Res 1986;377:177-81. Freedman RR. Physiology of hot flashes. Am J Hum Biol 2001;13:453-64. Barton DL, Loprinzi CL, Quella SK, Sloan JA, Veeder MH, Egner JR, et al. Prospective evaluation of Vitamin E for hot flashes in breast cancer survivors. J Clin Oncol 1998;16:495-500. Ziaei S, Kazemnejad A, Zareai M. The effect of Vitamin E on hot flashes in menopausal women. Gynecol Obstet Invest 2007;64:204-7. The NAMS 2017 Hormone Therapy Position Statement Advisory Panel. The 2017 hormone therapy position statement of the North American menopause society. Menopause 2017;24:728-53. Stuenkel CA, Davis SR, Gompel A, Lumsden MA, Murad MH, Pinkerton JV, et al. Treatment of symptoms of the menopause: An endocrine society clinical practice guideline. J Clin Endocrinol Metab 2015;100:3975-4011. Shifren JL, Schiff I. Role of hormone therapy in the management of menopause. Obstet Gynecol 2010;115:839-55. Maclennan AH, Broadbent JL, Lester S, Moore V. Oral oestrogen and combined oestrogen/progestogen therapy versus placebo for hot flushes. Cochrane Database Syst Rev 2004;4:CD002978. Mattson RH, Cramer JA, Darney PD, Naftolin F. Use of oral contraceptives by women with epilepsy. JAMA 1986;256:238-40. Ginsburg ES, Mello NK, Mendelson JH, Barbieri RL, Teoh SK, Rothman M, et al. Effects of alcohol ingestion on estrogens in postmenopausal women. JAMA 1996;276:1747-51. Lobo RA, Pinkerton JV, Gass ML, Dorin MH, Ronkin S, Pickar JH, et al. Evaluation of bazedoxifene/conjugated estrogens for the treatment of menopausal symptoms and effects on metabolic parameters and overall safety profile. Fertil Steril 2009;92:1025-38. Berman RS, Epstein RS, Lydick E. Risk factors associated with women's compliance with estrogen replacement therapy. J Womens Health 1997;6:219-26. Grady D, Sawaya GF. Discontinuation of postmenopausal hormone therapy. Am J Med 2005;118 Suppl 12B: 163-5. North American Menopause Society. The North American Menopause Society statement on continuing use of systemic hormone therapy after age 65. Menopause 2015;22:693. Haimov-Kochman R, Barak-Glantz E, Arbel R, Leefsma M, Brzezinski A, Milwidsky A, et al. Gradual discontinuation of hormone therapy does not prevent the reappearance of climacteric symptoms: A randomized prospective study. Menopause 2006;13:370-6. 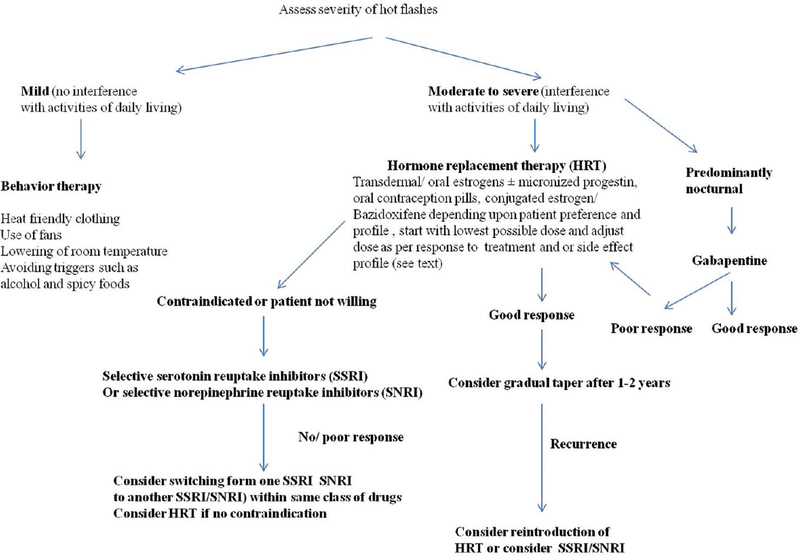 Aslan E, Bagis T, Kilicdag EB, Tarim E, Erkanli S, Kuscu E. How best is to discontinue postmenopausal hormone therapy: Immediate or tapered? Maturitas 2007;56:78-83. Kaunitz AM. Clinical practice. Hormonal contraception in women of older reproductive age. N Engl J Med 2008;358:1262-70. Nonhormonal management of menopause-associated vasomotor symptoms: 2015 position statement of the North American Menopause Society. Menopause 2015;22:1155-72. Loprinzi CL, Sloan J, Stearns V, Slack R, Iyengar M, Diekmann B, et al. Newer antidepressants and gabapentin for hot flashes: An individual patient pooled analysis. J Clin Oncol 2009;27:2831-7. Nelson HD, Vesco KK, Haney E, Fu R, Nedrow A, Miller J, et al. Nonhormonal therapies for menopausal hot flashes: Systematic review and meta-analysis. JAMA 2006;295:2057-71. Simon JA, Portman DJ, Kaunitz AM, Mekonnen H, Kazempour K, Bhaskar S, et al. Low-dose paroxetine 7.5 mg for menopausal vasomotor symptoms: Two randomized controlled trials. Menopause 2013;20:1027-35. Suvanto-Luukkonen E, Koivunen R, Sundström H, Bloigu R, Karjalainen E, Häivä-Mällinen L, et al. Citalopram and fluoxetine in the treatment of postmenopausal symptoms: A prospective, randomized, 9-month, placebo-controlled, double-blind study. Menopause 2005;12:18-26. Loprinzi CL, Barton DL, Sloan JA, Novotny PJ, Dakhil SR, Verdirame JD, et al. Mayo clinic and north central cancer treatment group hot flash studies: A 20-year experience. Menopause 2008;15:655-60. Bordeleau L, Pritchard KI, Loprinzi CL, Ennis M, Jugovic O, Warr D, et al. Multicenter, randomized, cross-over clinical trial of venlafaxine versus gabapentin for the management of hot flashes in breast cancer survivors. J Clin Oncol 2010;28:5147-52. Casper RF, Alapin-Rubillovitz S. Progestins increase endogenous opioid peptide activity in postmenopausal women. J Clin Endocrinol Metab 1985;60:34-6. Schiff I. The effects of progestins on vasomotor flushes. J Reprod Med 1982;27:498-502. Jin Y, Hayes DF, Li L, Robarge JD, Skaar TC, Philips S, et al. Estrogen receptor genotypes influence hot flash prevalence and composite score before and after tamoxifen therapy. J Clin Oncol 2008;26:5849-54. Jones SE, Cantrell J, Vukelja S, Pippen J, O'Shaughnessy J, Blum JL, et al. Comparison of menopausal symptoms during the first year of adjuvant therapy with either exemestane or tamoxifen in early breast cancer: Report of a tamoxifen exemestane adjuvant multicenter trial substudy. J Clin Oncol 2007;25:4765-71. Santen RJ, Stuenkel CA, Davis SR, Pinkerton JV, Gompel A, Lumsden MA, et al. Managing menopausal symptoms and associated clinical issues in breast cancer survivors. J Clin Endocrinol Metab 2017;102:3647-61. Prague JK, Roberts RE, Comninos AN, Clarke S, Jayasena CN, Nash Z, et al. Neurokinin 3 receptor antagonism as a novel treatment for menopausal hot flushes: A phase 2, randomised, double-blind, placebo-controlled trial. Lancet 2017;389:1809-20. Walega DR, Rubin LH, Banuvar S, Shulman LP, Maki PM. Effects of stellate ganglion block on vasomotor symptoms: Findings from a randomized controlled clinical trial in postmenopausal women. Menopause 2014;21:807-14. Othman AH, Zaky AH. Management of hot flushes in breast cancer survivors: Comparison between stellate ganglion block and pregabalin. Pain Med 2014;15:410-7. Kronenberg F, Fugh-Berman A. Complementary and alternative medicine for menopausal symptoms: A review of randomized, controlled trials. Ann Intern Med 2002;137:805-13. Nedrow A, Miller J, Walker M, Nygren P, Huffman LH, Nelson HD. 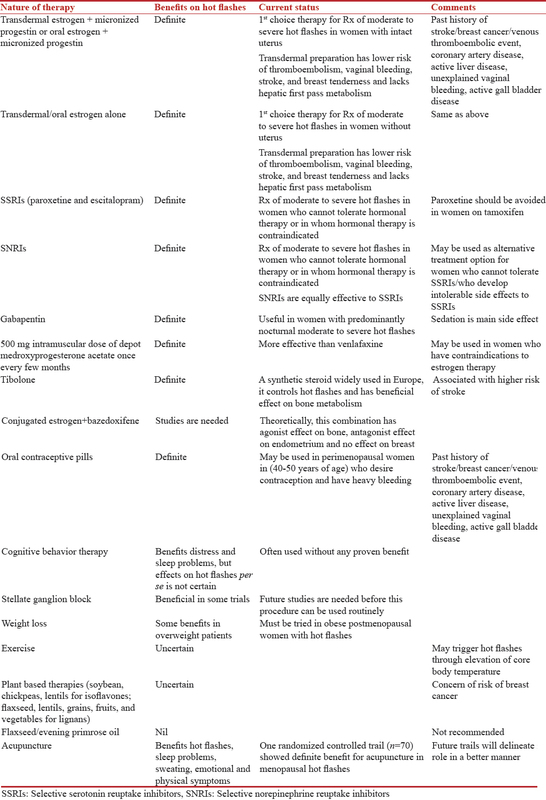 Complementary and alternative therapies for the management of menopause-related symptoms: A systematic evidence review. Arch Intern Med 2006;166:1453-65. Lethaby A, Marjoribanks J, Kronenberg F, Roberts H, Eden J, Brown J. Phytoestrogens for menopausal vasomotor symptoms. Cochrane Database Syst Rev 2013;12:CD001395. Dodin S, Blanchet C, Marc I, Ernst E, Wu T, Vaillancourt C, et al. Acupuncture for menopausal hot flushes. Cochrane Database Syst Rev 2013;7:CD007410. Smith CA, Carmady B. Acupuncture to treat common reproductive health complaints: An overview of the evidence. Auton Neurosci 2010;157:52-6. Lund KS, Siersma V, Brodersen J, Waldorff FB. Efficacy of a standardised acupuncture approach for women with bothersome menopausal symptoms: A pragmatic randomised study in primary care (the ACOM study). BMJ Open 2019;9:e023637.